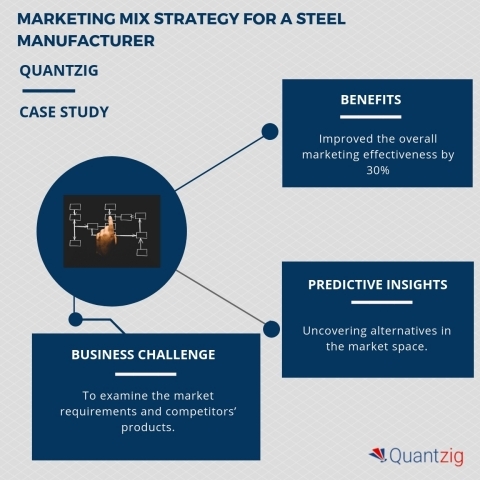 LONDON--(BUSINESS WIRE)--A global data analytics and advisory firm, Quantzig, that delivers actionable analytics solutions to resolve complex business problems has announced the completion of their latest marketing mix strategy engagement for a leading steel manufacturer. During the course of this engagement, the analysts at Quantzig helped a leading steel manufacturer to gain a clear concept of what their products stand for and what differentiates them from the competition. Additionally, it offered actionable insights into the best channels for their product promotion and helped them customize each channel to gain positive results. With the shifting focus on development and infrastructure, the steel industry in the US is expected to rise over the next few years. However, steel manufacturers are under constant pressure to identify continous fluctuations in the price of raw materials. Additionally, the aggravating competition was putting pressure on global steel companies to search for better ways to gain a competitive edge in the market. Thus, steel manufacturers are investing a significant amount of capital into marketing and R&D for differentiating their products from the competitors’ product. The key to success for steel manufacturers lies in identifying the right balance of marketing mix elements, which ultimately helps in accomplishing demands of customer while attaining business goals. The Business Problem: The client is a leading company that operates two integrated steel mills in South Korea and in California. With the growth in business, the client noted that the quality issues with the products they manufacture were affecting the sales rate of their company. So, they started looking out for appropriate approaches to streamline their marketing mix strategy to examine the market requirements and competitors’ products to meet the existing needs of their customers. The client was also facing issues in gauging target market regions for product promotion and sale. Furthermore, the use of inaccurate pricing strategies for their products resulted in them losing their customers to the competitors. Are you facing challenges to determine the effectiveness of your campaigns across online and offline marketing channels? Get in touch with our experts to know how our marketing analytics solutions can help. “Marketing without analytics is like driving with your eyes closed,” says an expert from Quantzig. The Solution Offered: Given the complexity of the situation, the experts at Quantzig developed a marketing mix strategy based on 4Ps – product, price, place, promotion. The experts first analyzed the product that included packaging, design, features, quality, and positioning of the product. The data obtained from this analysis helped the steel manufacturer to make their products better and improve customer service. Furthermore, the experts analyzed the production cost and target customers to determine the amount customers are willing to pay for their product. This helped the client to set a fair price for their products. In the final phase of promotion, the client was able to find the best channels for their product promotion. Gaining data-driven insights to deliver profitable results can be a daunting task. Request a free proposal and know how marketing mix strategy can help you boost your business outcome. Data-driven facts and digital attribution can help companies to create a sustainable competitive advantage. Request a free demo to know how marketing mix strategy can be utilized for the same. Attaining essential insights to upsurge sales, market share, and marketing ROI. Wondering how to develop effective marketing mix strategies? Request for more information now!